The description Gift Knife is something collectors of WW1 clasp knives will often come across. For many years the clasp knife with blade and tin opener with jigged bone scales (Pattern 8173/1914) was not thought to be an issue knife. 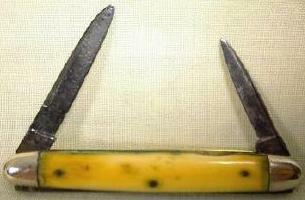 It has been referred to as a Red Cross Gift Knife and when no evidence could be found to support that belief, it was then assumed that it was the knife that was included in a small number of Princess Mary Gift Tins that were distributed to all British and Commonwealth troops for Christmas 1914. A knife was not part of the original contents of the Gift Tin but shortages of other items resulted in various substitutions. 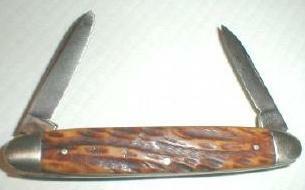 There are no known examples of the 8173/1914 pattern knife with any Military acceptance marks. Because of this it has been suggested that this fact alone is evidence that the knife was not an issue item. However, a close examination of many 6353/1905 pattern clasp knives which we do know were an issue item shows that very few have any Military acceptance marks. From this one can conclude that lack of markings does not preclude the knife from being an issue item. Some time back, I set out to research the history of the Gift Knife and verify what I had been told. As I searched for information to support the common belief that the 8173/1914 clasp knife was the Gift Knife, I soon came to realise that there was no evidence to support this belief. Using the resources of the internet and other collectors I searched for as much information that I could on WW1 Gift Tins and their contents. Apart from one small reference on the Imperial War Museum Web Site that a pen knife was substituted when there were shortages of other items, I have found no other reference. My enquiries have been unable to identify that knife. Even the Imperial War Museum could find no evidence. It came as a surprise to me that no matter where I searched, or who I contacted, I could not find any information to support the belief that the 8173/1914 pattern clasp knife had ever been distributed in the contents of any Gift Tin. To the contrary, I eventually came across information from Joe Sweeney a US based collector who specialised in WW1 equipment who had located documents that showed that the knife with blade, tin opener and jigged bone scales was an issue clasp knife compliant with pattern 8173/1914. Another collector Chris Pollendine, whose area of specialty was Gift Tins and who has collected many such tins, informed me that in all of the time he had been collecting that he had never found any evidence of the 8173/1914 clasp knife being included in any Gift Tin. He was of the opinion that the pen knife used for substitution in a small number of the gift tins was the small, common everyday pen knife of the times that was about 3" long. These images were provided by Chris Pollendine as the most likely type of knife to be included in the Gift Tins. Just as I was thinking that that was about it! In March 2015, I received an enquiry from Trevor Williams whose great uncle Fred Messer was killed at Gallipoli. One of the four items returned to the family was a pocket knife that had been handed out as a Christmas Gift to AIF troops in Egypt by the High Commissioner of Australia to the United Kingdom, Sir George Reid prior to the Gallipoli landing. He asked if I knew of these knives and was hopeful I could provide an image that could be circulated among the relatives to find if it still existed. Private Messer gleefully refers to the visit of Sir Geo Reid, and says that the High Commissioner's ((Sir G H Reid) present of a pocket knife to each of them (allotted by the Commonwealth Government) as a Xmas Box, was much appreciated. Over 10,000 knives had been given out, and more to follow, at the time Private Messer despatched his letter. The troops, severally, also received from the Australian War Fund Association, London, a large box of chocolates as a Christmas offering, which had the following inscription "To the Australian Expeditionary Force from the Australian War Contingent Association, London. A Happy New Year to one and all." So it appears that there was a Gift Knife after all. Not as part of the various Gift Tins that were distributed to the troops but as a specific Gift from the Australian Government for Christmas 1914. I have written about my search here. If anyone has any information on this subject please .